27 May. Rig under tow to Green Canyon Block 652. 28 May. Rig on location. Started running riser and blowout preventers. 29 May. Continuing to run riser. Picked up landing joint. 30 May. Rigged up choke and kill lines. Positioned rig and blowout preventers over wellhead. Latched wellhead. Closed blinds and installed diverter housing. Started picking up drill pipe. 31 May. Test blowout preventers. Picked up and started in hole with bottomhole assembly. 01 June. Washed and reamed to bottom, circulating synthetic-base mud in hole. 02–19 June. Drilling proceeded. Circulate mud to run casing. Started out of hole with drill pipe. 23 June. Finished pulling out of hole with drill pipe. Picked up cement head and 13-5/8 inch casing. 24 June. Finished running casing to bottom. Picked up casing hanger and landed casing in wellhead at 4,391 feet. Rigged up and pumped cement. Laid down cement head. 25–27 June. Laid down equalizer sub. Re-assembled equipment used to test for total dissolved solids. Tested blowout preventers. Picked up bottomhole assembly and ran in hole. Displaced hole with synthetic-base mud. Drilled cement and shoe. Circulated bottoms up. 28 Jun–03 July. Drilling hole to 21,130 feet. During this time period, winds remained relatively calm with seas 1-2 feet. Currents averaged around 2.1 knots. 04 July 0600 hrs. Drilling while monitoring tropical developments. 04 July 1800 hrs. Although the system was not yet a tropical storm, the Operator and Drilling Contractor had elected to suspend drilling activities at 21,715 feet at 1800 hours on July 4. Suspension of drilling activities occurred some 18 hours in advance of the incident. Personnel commenced circulating bottoms up to clean the well bore, and by 2300 hours started pulling the 6-5/8-inch drill pipe. All of the 6-5/8-inch drill pipe was out of the hole the next morning by 0830 hours (July 5, 2005). 04 July 2300 hrs. Started tripping out of hole, laying down 6-5/8 inch drill pipe. 05 July 0600 hrs. Continued laying down drill pipe. 05 July 0900 hrs. Rigged down 6-5/8 inch drill pipe handling tools, and rigged up 5-1/2 inch drill pipe handling tools. Thrusters running 70-80% with 5 engines (dedicated to thrusters) running 60%. 05 July 1000 hrs. The rig having difficulty holding its position, orders were given at around 1000 hours to space out the 5-1/2-inch drill pipe in BOPE and hang off the pipe with 260,000 pounds on the upper variable bore rams (VBR) on the BOP stack. Tripped out of hole 4 stands. Bit pulled up into 13-5/8 inch casing. Seven thrusters running 75% with 5 engines running at 70%. Current at 3 knots with winds at 23 knots. Operator aware of potential emergency disconnect. Rigged up 5-1/2 inch cross-over to top drive. Spaced out drill pipe in BOPE and hung off on upper variable bore rams within the BOP equipment. 05 July 1040 hrs. All 6 engines on line running 70% and 7 thrusters running at 84%. 05 July 1100 hrs. Started displacing 14.6 pound-per-gallon synthetic oil-base mud out of riser. Riser capacity about 1,538 barrels. 05 July 1130 hrs. Winds running 41 knots out of south with current at 3.2 knots while mud was being displaced. Rig position was slipping from its location. 05 July 1200 hrs. Rig struggling to hold position with 3.3-knot currents and 61-knot winds. Rig offset some 175 feet from well center. Contractor gives orders to function EDS. Waiting on Lower Marine Riser Package to release. Running 5 degree angle in flex joint. Contractor gives second order to function EDS, and subsea engineer activates from different pod (see definition of pod below). Rig offset some380 feet. Hard recoil. 05 July 1204 hrs. EDS function completed in 4 minutes. Slip joint pushed hard against moon pool BOPE guide, wedging the SDL tension ring. The rig rolled 5-7 degrees with 10-14 foot swells. The riser hanging below acted like pendulum, bending the inner barrel to the port side. Estimated 710 barrels spilled. Contractor directed vessel NNE away from the Marco Polo platform. 05 July 1300 hrs. Attempting to hold position some 12,474 feet from wellhead, but drifting. 05 July 1400 hrs. Rig holding position some 15,358 feet from wellhead. 05 July 1500 hrs. Rig location verified relative to Marco Polo and 14 inch-flowline. Closest distance between rig and flowline during drift was 4,700 feet. The pollution event was a result of the unplanned disconnect of the LMRP from the subsea blowout preventer equipment during a time of shifting loop currents coupled with quickly deteriorating met-ocean conditions from tropical storm developments, the sum of which pushed the rig’s DP system capability to the limits, leading to an unacceptable loss of rig position, prior to displacing the riser and surface lines of the drilling mud with seawater. The station-keeping criteria in effect at the time of the incident provided for no rig directives until such time as either the (a) currents reach 2.7 knots and there is a weather pattern that could produce 50 MPH winds within 200 miles of the rig or (b) currents reach 3 knots or higher. 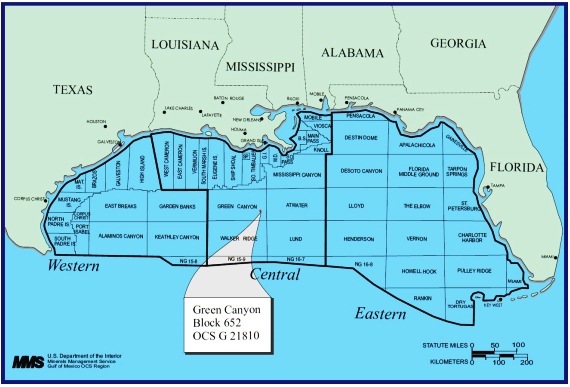 This pre-existing, rig-specific, station-keeping criteria did not reflect loop currents and associated eddies in the Gulf of Mexico. The rapidly deteriorating met-ocean conditions over an 18-hour period prior to the incident. However, according to Ensco Weather Logs and Eddy Watch Reports over the 7–day period prior to the incident, with relatively calm seas and winds, currents had run as high as 2.7 knots and had averaged over 2 knots throughout the period. Preparations to disconnect the riser with impending tropical development close to entering the Central Gulf of Mexico should have been considered very likely. The Ensco 7500 is limited inits station-keeping ability to approximately 2.5 knots of current at a 60-foot drilling draft, in calm weather (wind and seas). It appears that the Operator did not fully verify by prescribed methods the operational functionality of the vessel over a wide range of sea states, such as those expected or anticipated during the drilling campaign. Management of non-conformance issues regarding the likelihood of a failure mode to cause an unacceptable loss of position given existing or reasonably anticipated circumstances and environmental conditions should have been completely addressed by the Operator to conduct the well program safely and in a manner that would reduce risk to a level as low as reasonably practicable. Development of site-specific environmental/oceanographic data for the purpose of position holding and riser angle minimization considerations. Development of criteria for the initiation of riser disconnect operations as a function of impending tropical storm conditions. A routine review of T-time estimates during storm seasons. 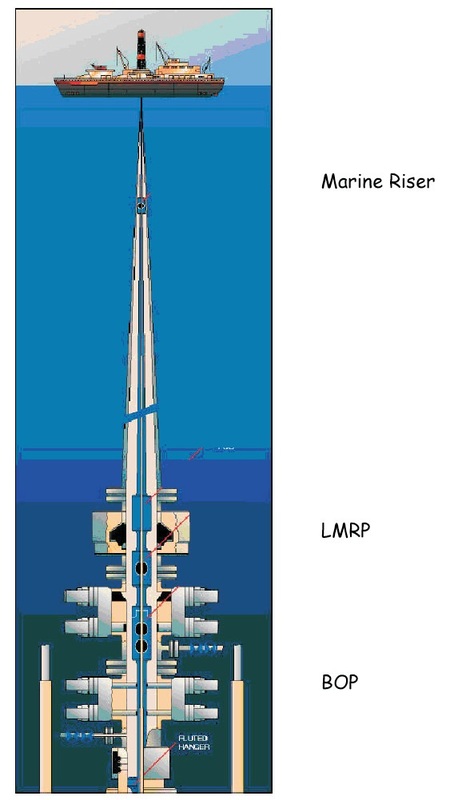 Consideration should be given of any sea bottom conditions (such as escarpments or cliffs or subsea equipment) and surface obstructions (such as nearby platforms) that would limit the direction the rig could move when disconnecting the riser. A description of how currents, sea states and weather will be monitored and all equipment and/or services are to be used. A description by the Operator of the station-keeping equipment and/or systems on board that support the rig classification and certification. 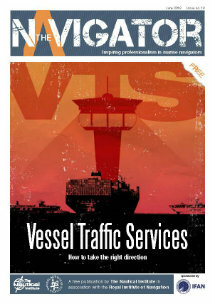 Pre-qualifications of DP vessels should include in the Pre-hire verification a complete vessel Failure Mode & Effect Analysis (FMEA) to highlight known failure modes, complete and inclusive proving trials, and evidence of systematic yearly trials procedures based on the vessel’s FMEA. « The Alternative ‘Alternative Fuel’?